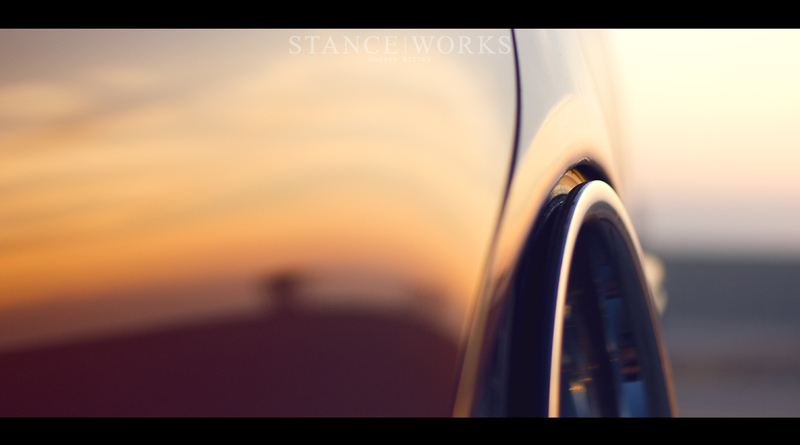 Almost two years ago, Austin Lee's EF Honda Civic was featured here on STANCE|WORKS, and to this day it is one of the few executed with such cleanliness. Followed up by a bagged 350Z and now this beautifully done Y33, it should be no surprise that Austin is sticking to his roots of simple, clean, and to the point. It's a recipe that has served him well, having turned out 3 notable cars at the impressively young age of 21. Perhaps what serves Austin best, however, is his independence towards his modding style. With his first build, Austin proved it didn't take a massive budget, a slew of parts, or "look at me" styling to build an attention-grabbing car. His Civic was as simple as it gets, perhaps even mold-breaking in the crowd commonly known for throwing the "less is more" attitude right out the window. Dumped on its belly over cream and chrome steelies, it was one of those cars "just worked." But there's no way one could expect Austin to stay content with an aging civic. He up and sold the car in order to fund the purchase of a Nissan 350Z. Wasting no time, he immediately repainted the car with a new-to-the-chassis champagne metallic color and followed that with air suspension and a set of VIP Modular wheels. There's little chance you haven't seen the now semi-infamous car if you frequent any automotive forums. But in now-typical Austin Lee fashion, he sold the car seemingly immediately after completion. But Austin is back once again, this time putting in work on an Infiniti Y33. He's only had it for a few weeks now, but we've come to expect such builds so rapidly from Mr. Lee. Austin's tastes are as true as ever, with a Car Studio JDS kit setting the theme for the exterior of the car, and a swap to the Japanese counterpart headlights, grille, and rainguards round it all off. To drop the car, Austin went with Megan Coilovers, but followed the path of his 350z by going with a bag-over-strut setup utilizing UAS bags and AccuAir management. The kicker, Austin tells me, is the fitment he's achieved on the 18x10 and 18x12 VIP Modular VX310s. His new-found home in the VIP scene insisted that the drop wasn't easily doable on 18" wheels, as 19"s are the typical choice for the bagged guys. Needless to say, Austin laughed in the face of adversity and set his subframe flat on the ground after modifying the suspension beyond the typical recipe of bolt-ons. Austin doesn't plan on stopping yet though. He's already wanting new wheels, more drop, and more camber. He's already modified his body kit, the only one in the USA. A full interior is in the works, and perhaps some engine work as well. He insists he actually wants to keep this car. How much truth there is to that will only be revealed if and when he actually sells it. In either case, we're in for a treat. Whether Austin continues to build this Y33, or if he sells it and moves on to the next one, there's no question it'll leave us impressed.